Plan your website structure with a prototyping software. 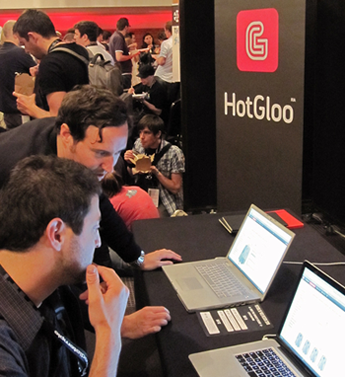 HotGloo has been designed to create interactive prototypes, and wireframes. This prototype tool can be used to help visualize planning processes in web projects and to co-work with team members. Curious? At HotGloo we've set the focus on 3 things: usability, innovation and communication. Unless other prototype tools our environment is simple and intuitive with a very low learning curve. We've also compiled a comprehensive guide that will help you getting started prototyping in almost no time. With HotGloo it's possible to co-work on one project as a team at the same time and communicate over prototypes with the help of feedback messages. HotGloo is being updated constantly to guarantee we are on the forefront of innovation. A prototyping tool tailored for you. A wireframe / prototyping tool that has been designed with a low learning curve in mind and for everyone involved in web and mobile projects. So whether you are a project manager, an information architect, a UX expert or working with a small project group or a large agency - this prototyping software is tailored for you.